You may have been told that breastfeeding will help you quickly and drastically lose extra weight you gained during pregnancy. Some might even tell you not to worry about what you eat because breastfeeding burns a ton of calories and the pounds will just melt off. Yes, some moms are able to shed the pounds more quickly than others while nursing. However, most will find that breastfeeding alone is not enough to lose those extra pounds. While breastfeeding does burn approximately 425-700 EXTRA calories per day (source), this alone may not be enough to give you the rapid weight loss you were hoping for. As a matter of fact, some women may have a hard time losing weight until they finish nursing. This is due to those lovely female hormones that take us for emotional rollercoaster rides and make fat loss a little tricky. Finding the right balance in cutting enough calories to lose weight without affecting milk supply can be challenging for some and takes experimenting. Lack of time, energy and motivation makes it seem like losing the extra weight from pregnancy is an intangible goal. The number one most important thing to remember is PATIENCE. The first few months with a newborn will fly by in the blink of an eye. Days blend together and three months will pass without even realizing it. Breastfeeding can leave us feeling constantly starving due to the extra calories being used to produce milk. The caloric deficit needed for weight loss can be difficult to maintain because breastfeeding mamas are typically hungrier than normal. Sleep deprivation is a very significant factor in weight loss. Not getting enough sleep can cause spikes in our appetite due to hormonal fluctuations. Hungry, sleep deprived moms prefer to satisfy cravings with simple carbohydrates which is not ideal for weight loss. This is a given. We would rather sleep or cuddle our squishy, delicious smelling newborn rather than get outside for a walk to burn some calories. Controlling our hormones and quality of sleep after having a baby is almost impossible. This is probably not what you wanted to hear. But it’s time to put those pregnancy cravings and eating habits at bay by making healthier choices. Snacking is much easier than eating full meals while tending to a new baby. But focus on healthy substitutions. 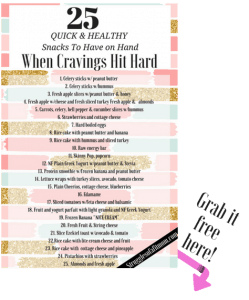 Here is a list of 25 quick and easy snacks when cravings hit hard. Instead of reaching for potato chips, grab some popcorn or low calorie Popchips. 1-2 Tablespoons brewers yeast and/or flaxseed are excellent milk producing supplements however they are not very tasty. Taste is irrelevant when you are trying to boost milk supply for your baby! Other quick foods that help boost milk, satisfy cravings and help lose weight are Lara Bars, RX Bars, or make some delicious No-Bake Energy Balls. This is the best recipe that I found and used. Get Your Snack Ideas Here! Please check your email to confirm your address and receive your download! Our bodies can have a difficult time distinguishing between thirst and hunger. This often causes us to reach for snacks instead of quenching our thirst. Breastmilk is primarily composed of water. Staying hydrated is extremely important in not only maintaining your milk supply but also aiding in weight loss. If you are trying to lose weight and notice a dip in your supply, ALWAYS try drinking more water or calorie free fluids before grabbing something to eat. Because milk production requires a lot of water, a dip in supply could mean you’re dehydrated. Carrying an insulated water jug with you at all times can help keep you hydrated. It is also very convenient to have when you are thirsty but cuddled up on the couch with a sleeping baby! My number one tip for breastfeeding mamas is to consume either Powerade Zero or G2 once a day. Every single time I noticed a dip in my supply, adding one of these drinks helped to boost it back up. The electrolytes help to replenish your body while keeping you hydrated. Make sure it is the low sugar/low calorie versions to avoid adding extra calories to your day! I was able to pump 200 EXTRA ounces of breastmilk in the first two weeks after my second baby was born. Here are some tips that helped. Finding time, energy and motivation to exercise sounds brutal when you are exhausted and barely functioning. However, exercise not only helps burn calories to lose unwanted weight, it will also help boost energy and mood. It can be challenging to find time to exercise with a newborn, especially if you have other kids. If you need some quick and creative exercise ideas to do at home with a baby, here is a list of some of the exact exercises and routines I did to help lose extra baby weight and build my strength back. Keep in mind, your number one focus after having babies is to strengthen your core and pelvic floor. These areas are the foundation of ALL exercises and workouts. The best part is the exercises can be done in just a few minutes a day at home. Want to lose weight but don't know where to start? Jumpstart your Weight Loss and Fitness goals! Receive 11 BONUS workouts, Fitness, Meal & Goal Setting Worksheets! Success! Now please check your email to confirm your download! You may have been told that eating six small meals throughout the day helps with weight loss by increasing your metabolism. While more recent research shows what you eat matters more than when you eat, consuming more frequent, SMALL meals while breastfeeding can help you stay on track with your weight loss goals. A breastfeeding mama continues to use extra calories to produce milk. Therefore, eating more frequently may prevent hormonal changes that can cause your body to store fat due to the decreased production of the hormone Prolactin. Waiting too long in between meals can decrease the production of this hormone as well as leave you feeling famished and more inclined to overindulge on unhealthy food choices. Remember, it is important to maintain healthy portion sizes when eating frequent meals throughout the day in order to stay within your caloric goals. This is way easier said than done. Especially if you’re not seeing results as quickly as you hoped. It is very hard not to get discouraged when you feel insecure in your postpartum body and frustrated that you are unable to reach your goals as quickly as you hoped. Breastfeeding can either help with weight loss or prevent you from losing those last few pounds. However, it is important to remember that everyone experiences weight loss differently. The most important thing you can do is focus on your own goals and not compare your progress to others. If you stay consistent, your hard work and dedication will inevitably pay off! The struggle to create and maintain a fit and healthy lifestyle as a brand new mom or mama of multiples is tough. With a little creativity, dedication, consistency and support, I promise you can reach your goals! My goal is to help give you the support, motivation, encouragement and ideas you need to succeed! What are some things you struggle with most in reaching your goals?